This chapter opens a radically new historical era in the history of international relations: This is the story of the second half of the twentieth century, the one most of us are close to personally. The world lived under constant threat despite permanent, sometimes tense and uneasy dialogue avoiding a global East-West confrontation until the end of the 80s, fortunately for humanity. With the last days of the Soviet Empire, and the fall of the Berlin wall, the World balance changed into the world we know today, paradoxically more complex and insecure. This long era of “cold war” (interposed conflicts, arms race and mutual influences on post-colonial world) held in suspense of a nuclear Apocalypse, seeing additional nations reaching the ultimate military power despite the 1980s disarmament treaties. This was a relatively “simple”, bipolar, somewhat balanced world, assured by MAD (Mutual Assured Destruction), the nonsense of an action that would result in a global obliteration of civilization. This is the essence of deterrence: Using it is a failure for humanity as a whole. 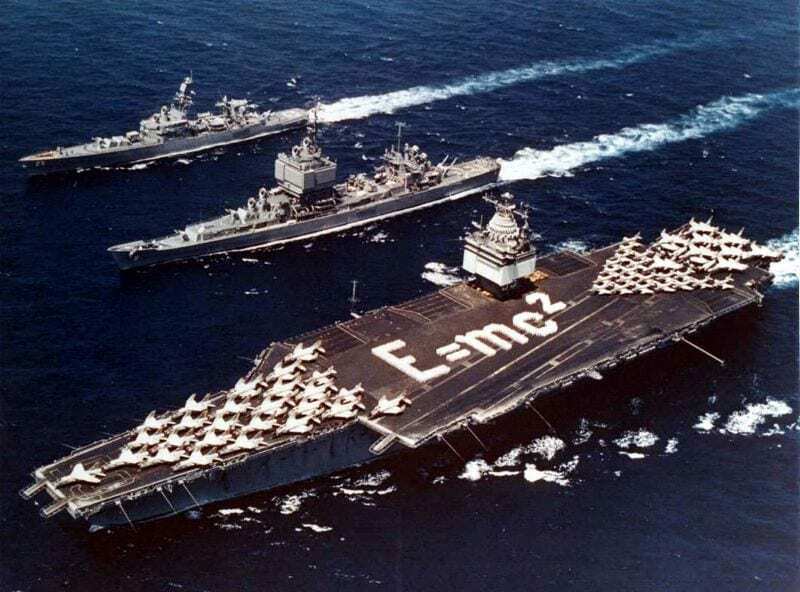 The embodiment of the US Navy might in the 1960s: Three nuclear ships (hence the crew forming “E=MC2” on the deck), the USS Entreprise, USS Long Beach and USS Virginia (or a cruiser of its class). This era saw two superpowers emerging victorious from the Second World War, both armed to the teeth and seeing themselves as leaders of their own vision for the world. These were two representatives of fundamentally opposite economic and political worldviews. Most of the cold war saw them ensuring new counties entering their sphere of influence (or prevent them to escape or shift sides) and trying to rally others. Despite the end of the war these to superpowers kept teir military expenditures and armaments industries at the very high level. These were partly financed by exports towards friendly nations. Eventually the weight of these military expenditures combined with the economical failure of the communist regime precipitated its demise. Disappearance of the Soviet threat had some impact on US spending in this area, but “Uncle Sam” still considered its leading role in the global stability, had powerful Military-industrial lobbies, tries to keep the edge in technology, and dominate the export market. Although modern Russian fleet is the shadow of the former Soviet naval power, China in a decade grew to 6th to 3th naval power, resulting in Japan and India also launching ambitious naval plans as well as neighboring nations. 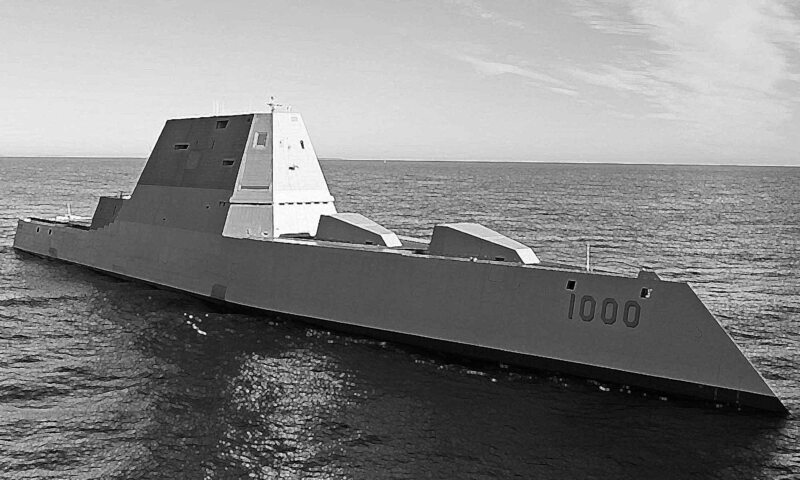 It’s still not the time for the US Navy to disarm or be disengaged, in particular from Asia. 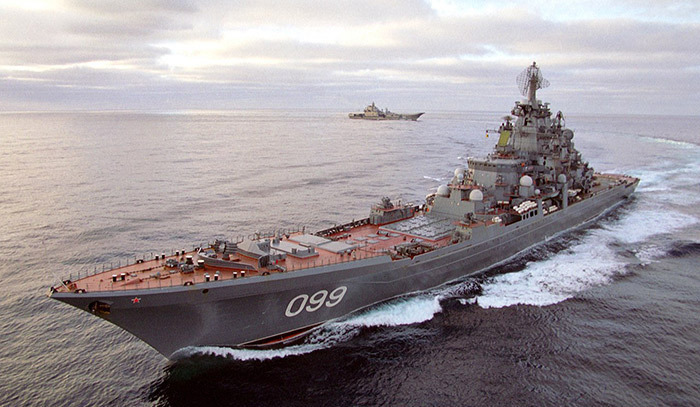 The Kirov class “battleships” are still the largest missile cruisers afloat worldwide, a fitting response to US reactivation and modernization of the ww2-era Iowa class battleships. 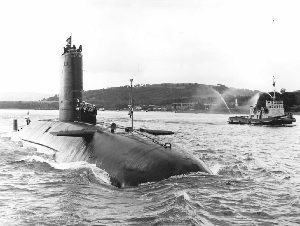 Navies of the two blocks constituted a large part of the nuclear deterrent policy, through ballistic missile carrying nuclear submarines (SSBNs) predominant because of their long cruise and stealth capabilities, plus global strike capabilities. The aircraft carrier, still king of the surface was adopted as the pivot of conventional task forces, beefed up with dedicated amphibious ships. Such as mobile air base and center of any response force they are the symbol of global projection of forces and a crucial way to keep order on the even seas. US Aircraft Carriers were also (and are still) the main threat that largely shaped tactically and technologically the Soviet and now Chinese fleets. 1990 is the second turning point as not only world fleet seemed to have reached a peak in tonnage, it was the end of the cold war, from which the Soviet Navy in the following years was amputated nine tenth of its operational tonnage for budgetary reasons and poor maintenance. The naval forces of the two superpowers were obviously the most studied in the context of the Cold War. Both constituted by far the cornerstone of their respective military organizations. NATO included countries of Western Europe, future European Union, and some countries on the periphery such as Turkey. These were opposed to the Warsaw Pact, grouping under the tight control of the Soviet “big brother”, popular republics of eastern Europe, beyond the Iron curtain. The balance of forces remained uneven: The combined gross tonnage of the American, British, French, Italian, West German fleets alone far exceeded that of the Warsaw Pact, which most nations had a much reduced maritime area in charge and limited ambitions. There were also fleets from counties not bound by treaties, but yet still more or less supported or in the orbit of one or the other, namely in Asia. Japan sided with the US, and China with the USSR. Many “non-aligned” countries emerging from decolonization, had a modest budget, and choose in general a prudently neutral policy. Naval Exports, like other military hardware often reflected a presupposed Soviet or American alignment in the eyes of experts, or “sympathizers” shifting side at some point like Egypt. Cuba for example was firmly under the American grasp, but approached the USSR at the end of the Batista dictatorship. Few were the other South American countries to completely shift towards the east as US secret services deployed time, advisors and money to keep these countries out of communist influence (Monroe doctrine). 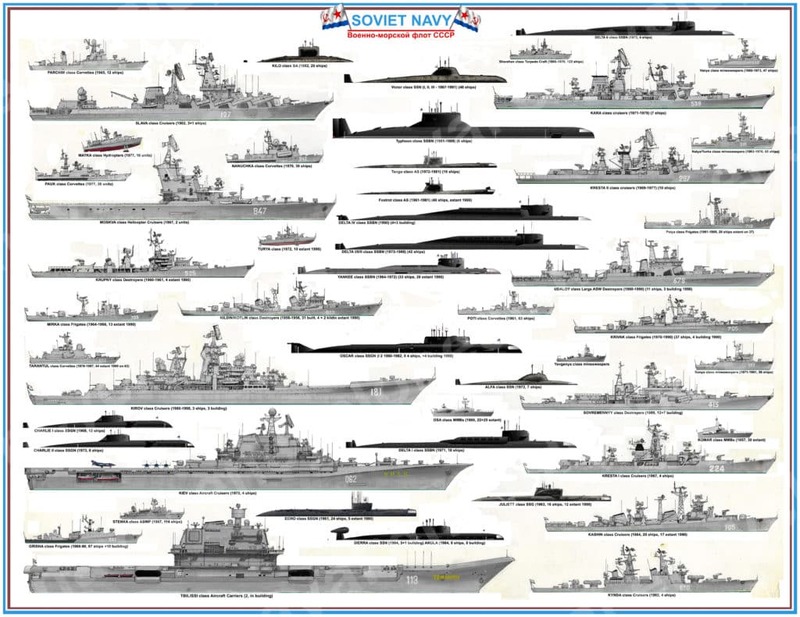 The Soviet Fleet 1947-1990, for forty years the world’s second largest. This famous acronym grouped within it the most powerful navy in the world, those of the great traditional powers of the west, fronting the Warsaw Pact. The famous treaty was signed in Washington in 1949, already involving the occupying powers of Germany, namely, USA, Great Britain and France, and it naturally added Canada and the Netherlands, Belgium and Luxembourg. The treaty was proposed in 1949 in Denmark, Portugal, Italy, Norway and Iceland. It was a treaty of mutual defense and assistance to overawe the communist block. When NATO was signed in 1949 Stalin took note, but not decided to mount a rival organization. After he was gone, with the advent of Nikita Khrushchev, West Germany ratified in turn the Atlantic Treaty and was therefore “in the process of re-militarization.” As a consequence, the heads of the Kremlin tried therefore to set up a similar organization. The Warsaw Pact was signed on 14 May 1955 between the communist countries of Europe (China was excluded). Besides the “Big Brother” (USSR), signatories were Poland, Czechoslovakia, Hungary, Bulgaria, Albania, Romania, and East Germany. This 11 articles text stipulated that new accepted members could only be included with the consent of the other nine. Yugoslavia at the time, under the leadership of Tito, remained neutral. Command of forces in these countries went suddenly into a single structure, headed by the commander in chief Koniev at the time. The naval forces of these countries spent the same time under a single command (Soviet), and naval policies set according to the needs of the community. The RDA for example, was quickly specialized in mine warfare. Each country sent a representative to the annual ordinary meeting. This pact enshrined the Soviet grip on Eastern Europe: When Hungary tried to be neutral in 1956, the uprising was crushed and the government overthrown and replaced in two weeks. Later she did the same at the Spring Prague in 1968. This intransigence also caused the removal of Albania, which was not worried because of its geographical isolation among neutral nations. In 1968, Albania, therefore, is to withdraw, and China, introduced from the beginning as a simple observer, also step down in 1962. In 1985, it was decided to extend it for a period 20 years. It ended in 1991 following the fall of the Wall and the dissolution of the Soviet sphere, formalized in June in Prague. Subsequently, in 1999, three countries of the old covenant came within NATO: Poland, Hungary, and the Czech Republic. Poland sent troops during the invasion of Iraq and supported the NATO position of the country sided with the USA. -USSR, GDR, Poland, Romania, Bulgaria, Albania. In 1960, the UN had 99 sovereign states (51 to its origin to the San Francisco Conference in 1944), and this annnée signed a record with the arrival of 17 new states, newly independent African essentially. In this lot, it is difficult to systematically arrange these countries by sympathy for one side or the other, and in fact, one must appeal to what the term “non-aligned”. In the 50s’, many countries arrive to the post-colonial independence movement continues. Therefore, the diplomatic face of the world changes and before both the refusal of colonial subjugation, some leaders of these countries also argue for ideological independence, or freedom to choose their own development model. This is a time when born the concept of “country in development” and “third world”. The initiators of this movement were Tito, leader of Yugoslavia since 1945 and separated from the Soviet bloc by her attitude considered too independent, Nasser, leader of Egypt, who dared to nationalize the Suez Canal dear to former colonial powers, France and Britain, like Nehru, the leader in grip of India, Sukarno of Indonesia, U Nu of Burma, and Haile Selassie of Ethiopia. A founding meeting took place on Indonesian island of Brioni in 1956 and lectures are followed in the countries concerned. The long period between 1945 1990 will see many prominent personalities in naval affairs on both sides, forging policies or having a direct influence on naval reforms, and key figures. The list will include at least those who have had an influence on the strategy/naval tactics, decisions of intervention, conduct of operations, ministers or secretaries of state, spies, personalities of the maritime world. Naval hardware of the 1960s is substantially enhanced compared to 1945. Still, the gun reigns supreme, as missiles are still in their infancy: Slow, massive, lacking range or accuracy. However more modern fire control systems and radar-assisted weaponry is on the rise. 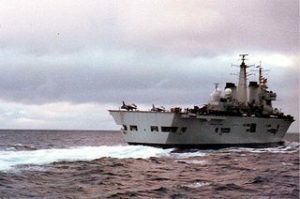 Helicopters are introduced on board cruisers and destroyers to provide the required ASM range. The major change in these two decades are the withdrawn of ww2-era battleships. Only cruisers remains, re-branded as escorts for the aircraft carriers. Still, cruisers and destroyers are bristling with gun. However in the 1970-80s, clearly guns gradually disappearing, replaced by discreet silos for missiles, embedded into the hull. Best example of that is the late 1970s class of missile cruisers built by the USSR. They were so massive that experts quickly dubbed them “battleships”. But a ww2 admiral would have trouble to identify the ship as such, but for the imposing superstructures and radars. The entire front part of the hull indeed, seen from profile lacks any turret. Only two are showing at the rear. All its firepower, providing a multi-layered umbrella against submarine, surface as well as aerial threats; is largely hidden from view, deep inside the hull. 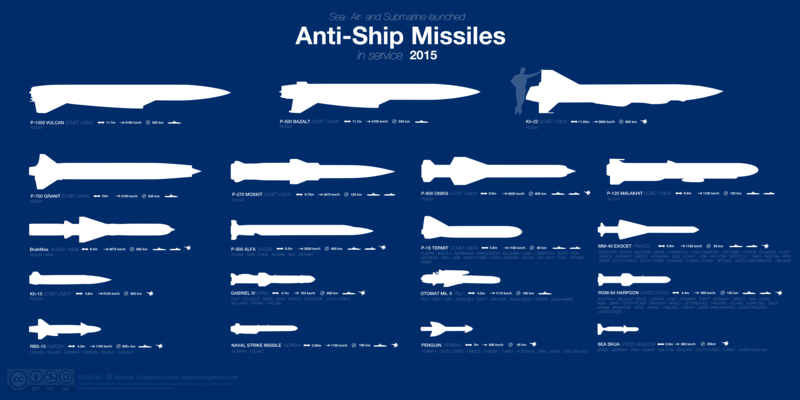 Deadly missiles able to destroy an entire aircraft carrier with a nuclear tactical warhead, or destroying incoming missiles ad planes at all ranges. What’s really new revolves around the progressive disappearance of the cruisers, replaced by destroyers, themselves up-sized up to the size of cruisers, followed by frigates and corvettes, all bearing certainly a much deadlier arsenal compared to the average heavy cruiser of the 1940s. Less ships, but much costier and with incredible capabilities. To gave a small anachronistic comparison, a single Soviet frigate of the Krivak class (3000 tons) reappearing in the 1940s would have been able to destroy single-handily four heavy cruisers (thanks to the long-range SS-N-14 “Silex”), forty bombers airplanes (SA-N-4 “Gecko” SAMs), destroy at least a dozen submarines in no time (two banks of four guided long range HE 533mm torpedoes and near the surface with two multiple rocket launchers RBU-6000) or destroy all approaching strafing airplanes with two radar-guided QF 76mm turrets. The average 1944 frigate was armed with a single 76 or 105mm shielded gun, four 40mm bofors, two 20mm AA guns and a handful of ASM grenades, without radar but at best a crude “huff-duff” trigonometric system and sonar. Komar FAC (Fast Attack Craft). This kind of light ship, much faster than ww2 MBTs was also armed with two medium-range anti-ship missiles SSN-2, capable to destroy a cruiser over the horizon. Such capabilities gave any small marine a significant deterrent if need be. This is one of the numerous illustrations provided on this section. 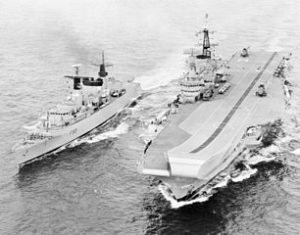 The Cold War was eventful, although never saw large naval direct confrontations. The Korean War was mostly a land affair, with the exception of a decisive amphibious operation at Inchon and the rôle played by the US Navy for support. The was the first of the “containment” doctrine conflicts trying to avoid countries recently gaining independence joining the Communist sphere, a scenario repeated against imperialism embodied by the ancient colonizers (mostly from Europe, therefore affiliated with the West). After Korea, Viet-nam was the other war in which the US Navy played an important role. The Cuban crisis was another major event, seeing a naval blockade also orchestrated by the US Navy, and largely successful combined with other means to avoid a nuclear war. 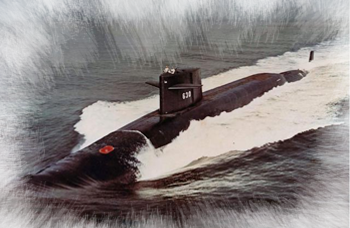 Interventions in the “backyard” of the two superpowers also sometimes involved limited naval assets, and technological rivalry, arms race, tactics race, silent (spy) war, especially true for submariners. Who knows (for the happiness of novelists like Tom Clancy) what formidable naval battles were avoided in the hushed silence of diplomatic cabinets? We’ll have to wait for additional declassified documents to know more about these events. 1945-1954: The Indochinese war: French naval assets and action. 1956: The intervention in Suez: British and French Fleets engaged. 1960: The Cuban missile crisis. Soviet and American fleets and naval policy. 1990: The Gulf War. US Navy involvement. Post 1990: Reshuffled balance of tonnage and emerging naval powers.